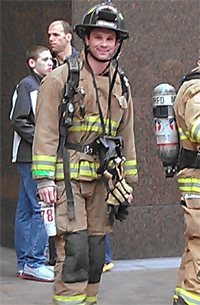 One of our authors (pictured on the right), Firefighter/Paramedic Scott Hiskey (who writes most of the medical-related articles you read on Today I Found Out), every year participates in the coincidentally named Scott Firefighter Stairclimb, where more than 1500 firefighters race up Seattle’s tallest building in full firefighter gear (including their heavily thermally insulated suits and air masks that due to being demand driven only give about 90% of the air normal as you have to breathe in a bit before it kicks in)- climbing 69 flights of stairs (1311 steps, 788 ft.) wearing over 50 lbs. of gear. Why do they do this crazy thing? To help raise money for the Leukemia & Lymphoma Society. Last year this stairclimb raised over $1.2 million to be used towards cancer research and to help support cancer patients and their families. As you might imagine during the climb, much vomiting ensues as these firefighters race up the flights of stairs, gasping and baking in the extreme heat in their full gear. Our writer, Scott, generally finishes in the top 10%, completing the climb in around 16-17 minutes. In any event, it’s a great fund raiser supporting a great cause and every donation counts- even just $1 donation from 10% of the people who read this post would add up to a couple thousand dollars to support cancer research and cancer patients. If you’d like to donate to this cause and sponsor Scott’s “climb for a cure”, please go here and then in the webpage that comes up, click the “Donate Now” image button on the right sidebar. Thanks!